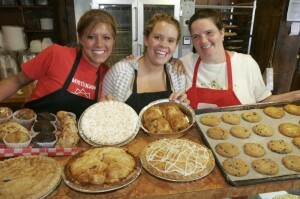 Hill High Country Store offers fresh-baked pies and cookies, local foods, produce, and wines, and handcrafted products. Hill High Country Store | Round Hill If 37 different pie varieties doesn’t catch your eye, maybe this will! Hill High Country Store has been around for more than 60 and prides itself on using the freshest locally grown ingredients from the Loudoun County area. Get a taste of the season’s flavors, with more than five apple pie varieties, as well as their award-winning pumpkin pie. It’s so good you’re going to want to eat it straight out of the pan! Proper Pie Co. | Richmond Keeping it proper! Proper Pie Company brings New Zealand-style pies to Richmond, offering specialty savory pies like steak & cheese, vegan mushroom & lentil, smoked salmon, potato & leak, and more. After your finished with the savory move on to the sweet and try out their pumpkin & salted caramel pie. Or how about blueberry-apple or peach & blackberry cobbler? Their menu changes daily, but the deliciousness remains the same! Several vegan options are available, as well as ice cream to top off your sweet selection. Pie Gourmet | Vienna Fruit pies, cream pies, dessert pies, oh my! And that’s not all. Pie Gourmet has a selection of more than 50 custom dessert pies, 13 dinner pies, 10 cheesecakes, gluten-free pies and MORE! This local bakery serves up some of the best pies in Virginia, where not only do the locals swoon, travelers from all over the world have made stops to pick up some delicious goodness. The Washington Post hailed it as “a gem among local bakeries.” Seasonal pies are always available. How about their apple pie options? Apple-cranberry, apple-raspberry, French apple, apple-peach and just plain (and just as delicious!) apple! Or how about traditional pumpkin pie, chocolate cream or peach melba?! If you’re not hungry yet, guess what? They have some dinner pies too! Broccoli-cauliflower, crab & mushroom, Mexican and more… heavenly. 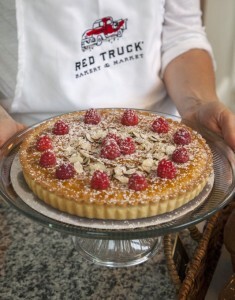 Red Truck Bakery & Market | Warrenton One of “America’s 50 Best Bakeries” — Daily Meal. “Best Bakery, Best Locally-owned Coffee House, Best Breakfast Place and Best Place for Sandwiches” in ALL of Northern Virginia.– Virginia Living magazine. It’s one of the “30 Places to Eat in Virginia Before You Die.” Must I go on? To no surprise, Red Truck Bakery & Market serves up phenomenal, fresh, seasonal pies. This time of year, indulge in a double-crust or Dutch crumb topping apple pie. Or there’s always pecan, lemon chess and Derby pies with pecans, chocolate chips and bourbon. Red truck’s mincemeat pie, their one-man crusade to resurrect the maligned pie was featured in Esquire magazine; they deemed it “mission accomplished!” And one more thing, a little publication called Conde Nast Traveler magazine named it as one of “America’s 13 Sweetest Bakery Destinations.” Come n’get it! Mom’s Apple Pie | Leesburg & Occoquan Mom’s Apple Pie Co. prides itself on their dedication to baking the very best natural, preservative-free pies. The boys hand peel fresh Shenandoah Valley apples and hand mix their premium fruits. But that’s not all! As you’re devouring your pie, take note of their made-from-scratch, flaky, and oh so tasty crust. Try these on for size: the original apple pie (never gets old! ), butter pecan apple crumb, pumpkin, raspberry-peach, almond amaretto pies and more! They also offer sweet potato and mincemeat pies that are to die for! This family-owned and operated gem is one you can’t miss! Family fun at Carter Mountain Orchard. Carter Mountain Orchard | Charlottesville Pick-your-own seasonal fruits and veggies at Carter Mountain Orchard, then head inside for some great recipe inspirations! 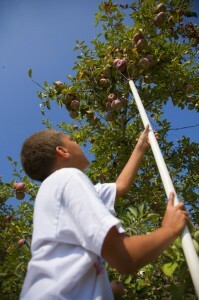 The orchard offers more than 30 apple recipes, as well as peach, strawberry and sweet cherry. Swing by Aunt Sarah’s Barkery & Mountain Grill for their own freshly made, mouth-watering apple pies. Piled high with their own fruits, the pies are available by the whole, half or slice. The orchard is open through the end of December, so make sure you get in to stock up for the holidays! Marker-Miller Orchard | Winchester Make a day of it and head to the country for Marker-Miller Orchard. Pack a lunch and head out to the apple orchards and do some apple pickin’. They have plenty of picnic tables throughout the orchard, so feel free to take a break and eat up! Then retire to the main building and relax on the front porch in one of their rocking chairs, and take in the beautiful mountain scenery. Swing by the bakery and grab one of their made-from-scratch, homemade pies. The caramel-apple-walnut sounds pretty good, huh? And there’s also apple dumpling, pecan and nearly 20 other selections, including three sugar-free options. Gotta fill up before you head home! And with your fresh-picked fruit you’ll be able to whip up some fresh-baked goodness yourself! These destinations are stunning in their own right, but couple them with the colors of fall and you have a real winner. – Originally, the estate was more than 8,000 acres. Presently, an estimated 500 acres have been preserved. – See the “witness tree,” a white oak yet standing from Monroe’s time on his Highland plantation. – Archaeology and restoration is always in progress at Jefferson’s personal retreat. – Washington’s family moved to Ferry Farm when he was six. – See the home site along the Rappahannock River. – Archaeology lab allows visitors to see artifacts discovered on the property. 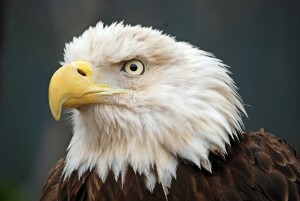 – Periods of history include Native American, Pioneer, Revolutionary War and Civil War. – Special tours and a pioneer summer camp are available. – Jamestown was settled by the English in 1607 as the first permanent colony in the New World. 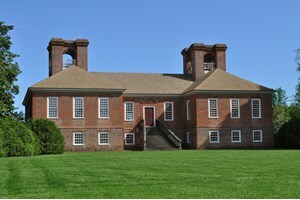 – Colonial Williamsburg is the largest living history museum in the country, and was the first capitol in the new World. – Yorktown is where the American Revolutionary War was won. It was October 19, 1781. 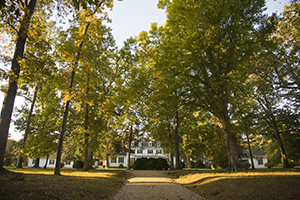 – Original grounds were 3,408 acres; today the estate is 261 acres. 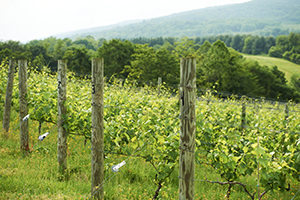 Virginia is becoming widely known for its great wine, but have you seen the wineries themselves? They’re gorgeous! We’ve identified wineries with tremendous views and great patios, wineries that are within a mile of a bed and breakfast, those with fireside sipping, and those that are great for families. Today, however, we want to shine a light on the wineries that are meant for those of the drinking age only. These wineries are places to get away from everything life throws at you, including a baby rattle. I’m a mom of three. 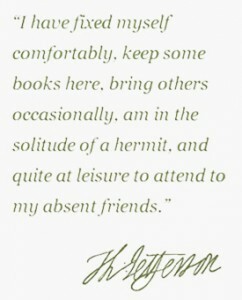 There are days I’d like to enjoy the company of my husband without the sounds of children – mine or anyone else’s. If you find yourself in the same boat, this could be a nice asset for you. In addition, I found a recent article from The Armchair Sommelier. Specifically, read the “Warning. I’m about to get on my soapbox.” section, with which, I concur. Then read the explanation from Chrysalis below. 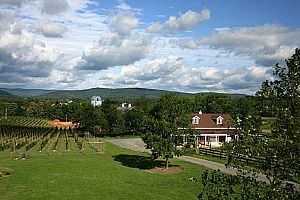 While there may not be a written rule one way or the other at a majority of Virginia’s wineries, I would research the visit beforehand if I were to seriously seek family-friendly or adults-only. Are there children in any of the photos on their Facebook page? Is their tasting room particularly upscale or ornate? 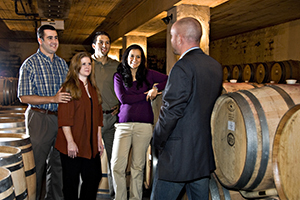 Does the winery tout their family-friendliness? 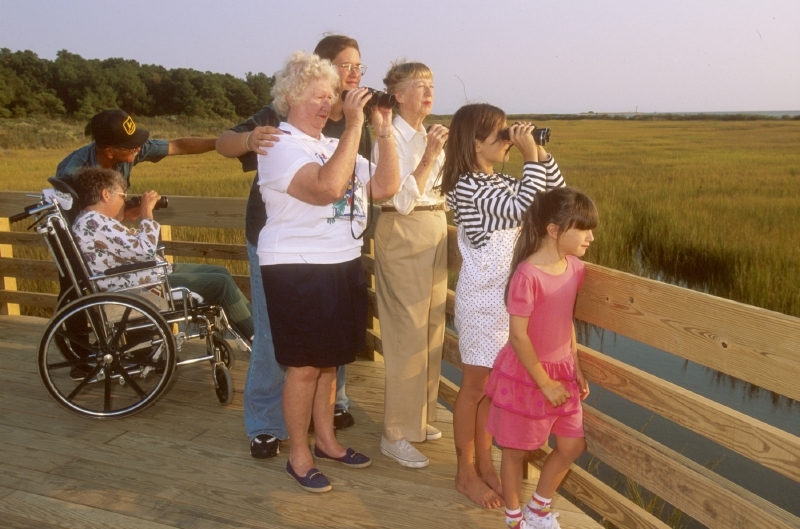 Though they’re family-friendly, are there adult-only spaces set aside? Don’t forget to consult the post I wrote a while ago about family-friendly wineries. If you’re looking to relax and taste without your children in tow, skip the ones found therein. Sound Off: Which wineries do you love for the lack of children? Everything that needs to be done is getting done in preparation for the RTCC awards on Sunday. One thing that tends to happen right at the end is the media part. In past years, I’ve been on TV to talk about the event; one year, Audra Honaker was kind enough to do a TV spot to tell the Artsies story. This year there will be a piece in the Times-Dispatch and an online blurb in Style. There’s talk of an interview on Open Source RVA. As I’ve done some of the media stuff – always awkward since in most other circumstances, I’d be the one doing the interviewing – I’ve struggled with new things to say or ways to summarize the event that really captures what it is. After 7 years, I often find myself thinking you just have to be there to get it. It can be a rancorous and rowdy time, but every year I’m surprised at how it ends up feeling like a ‘community’ event, almost like a professional block party. Everybody ends up working with everyone else in our little town so, rather than a lot of grinding of teeth and stomping of feet, most years involve general good cheer; delight in being out and celebrating; and proud support for coworkers and friends. Today – inconveniently after most of the interviews and stuff had already happened – I remembered that this year we are introducing the ‘Most Promising Newcomer’ award. It occurs to me that this award captures much of the aspirational and promotional intent behind the Artsies. The professional performing arts world is not a particularly warm and welcoming place. So very few people can make a living in it and even fewer make it big. Sometimes luck seems to be significantly more important than talent. Superficial judgment runs rampant. For young people who just want to express themselves or gain an outlet for their creative impulses, disappointments can be myriad and multifaceted. With the Most Promising award, we wanted to recognize the potential in Richmond’s talented younger professionals and, in a small way, welcome them into a community that I think is a little different than he or she might find in other towns. And with the Artsies in general, we want to show the greater Richmond community (and anyone else who might be paying attention) that we have some very special things happening on our stages. 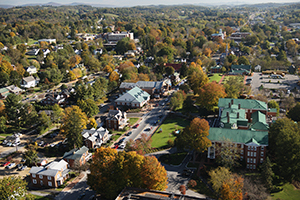 We may be a middle-sized city but – given the likes of Emily Skinner, Zak Resnick, Clay Mcleod Chapman, Taylor Richardson, and many more – we have shown that we can produce big talents. I’m excited by the introduction of this new award. 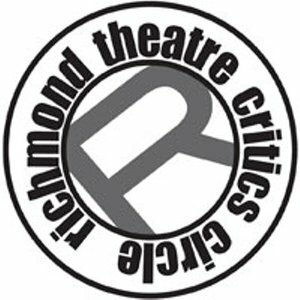 But it also makes me reflect on how, when my cohorts and I started these awards seven years ago, we thought of Richmond as one of the Most Promising theater markets in the country. Last season’s crop of outstanding productions only reinforces that opinion. Please join me on Sunday to celebrate them and the hard work of everybody in this great community. 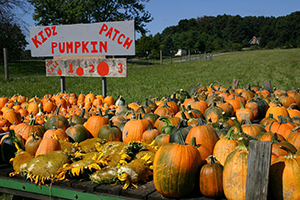 If you’re planning to head out to the pumpkin patches for fall fun, or in search of pie pumpkins or carvable beauties, we obtained some recommendations to make your search for the perfect patch an easy one. 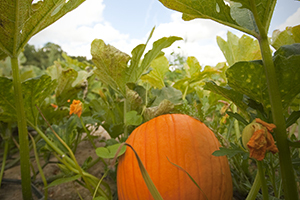 Here are the top pumpkin patches mentioned by locals in-the-know. The Major Graham Mansion in Max Meadows (known as Haunted Graham Mansion in the fall) will have a 1,000-acre pumpkin patch awaiting your arrival next year! The video clip below shows pumpkins being picked for retail delivery. Next year, they’re yours for the pickin’! Post by Mary Lin Brewer. Thomas Jefferson tried to grow classic wine grapes, Vitis vinifera. But there wasn’t the technology in the late 18th and early 19th centuries to overcome some of the difficulties in producing the same vines that thrived in Europe in the New World due to climate and disease here. Fast-forward almost two centuries, and vintners here found success. In fact, over the past 30 years, Virginia wines have found their rightful place at the table, and are recognized for their caliber and characteristics. October is Virginia Wine Month, a time to venture out across the state to visit some of the more than 200 award-winning wineries and celebrate by raising an extra glass or two. It’s no secret that it’s a great time now – as well as the whole year through – to enjoy Virginia wine, but here are a few insider tips for making the most of your sips from three Governor’s Cup-winning winemakers. 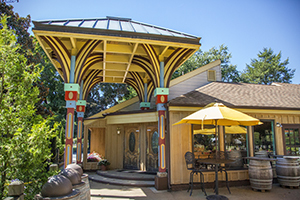 Fabbioli Cellars is a family operated winery focused on offering a unique tasting experience of artisan and well regarded wines from grapes grown on the estate and in the region. A Signature Wine: Fabbioli Cellars’ Tannat has been quite well regarded. It was awarded a Gold Medal in the Governor’s Cup competition and it got a spot in the Governor’s Case. It is full bodied red with firm structure, a bit of savory character as well as lots of rich red fruit. 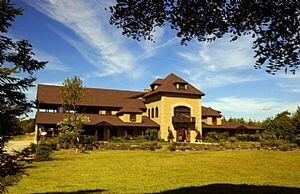 Tours/Tastings Offered: Daily, 11 a.m. to 5 p.m.
Fabbioli started in the wine industry in upstate New York in 1981. “I love working the farm and being able to grow a crop that can turn into a product that can last for years and can be very well regarded. 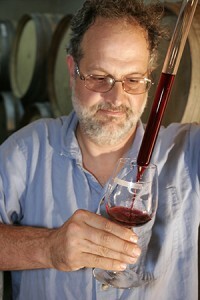 “I spent 10 years in California working in the cellar, making home wine and studying viticulture. What sets Virginia wines and wineries apart from others? What are some tips for tasting, whether at the winery, a festival or at home? What trends do you see in Virginia wine? What are some of your favorite wine and food pairings? 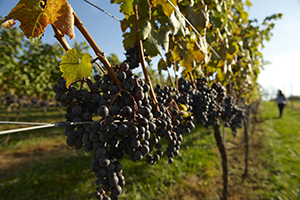 How will you be celebrating Virginia Wine Month? 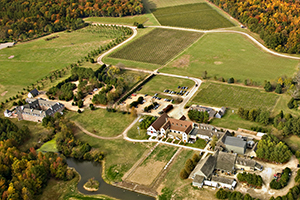 This winery won Gold Medals in the 2014 Virginia Governor’s Cup awards for their 2011 Tannat and 2011 Tre Sorelle. They won a Silver Medal for their 2011 Cabernet Franc, and Bronze Medals for their 2012 Chambourcin and Raspberry Merlot (NV). From the tasting room in a historic, restored Amish barn, views of spectacular sunsets behind the nearby mountains are the backdrop to acres of rolling vineyards. A Signature Wine: Viognier is the most popular white wine at Sunset Hills and a specialty among the white wines produced. The wine is highly floral, texture-driven, exotic and bright. Tours/Tastings Offered: Monday-Thursday, noon to 5 p.m.; Friday and Sunday, noon to 6 p.m.
Nate has been working in vineyards and wineries for 10 years. “I enjoy the cyclical, seasonal nature of the work, and the fact that there is a lot of intuition, experimentation, creativity, and flexibility required to explore the best use of our vineyards and grapes. This winery won Gold Medal in the 2014 Virginia Governor’s Cup awards for their 2010 Mosaic. They won a Silver Medal for their 2010 Cabernet Sauvignon, 2010 Peit Verdot, and 2012 Cabernet Franc. They were awarded Bronze Medals for their 2012 Merlot and 2012 Sunset Red. The winery, the Gabriel Archer Tavern, and the Café Provencal, as well as a small boutique hotel, Wedmore Place, are located on the historic 300-acre Wessex Hundred farm. A Signature Wine: Created in the Virginia style, Adagio is a balanced wine with the fruit, oak, tannins and alcohol blended in the Bordeaux style. It is 42 percent Cabernet Franc, 30 percent Merlot and 28 percent Petit Verdot. Tours/Tastings Offered: March-December, daily, 10 a.m. to 6 p.m. January and February, Monday through Friday, 11 a.m. to 5 p.m.; Saturday and Sunday, 10 a.m. to 6 p.m.
Matthew’s father introduced him to the joys of wine at an early age. “I grew up collecting wines from around the world and sharing with my father at dinner. I then decided to turn my hobby for wine into a career. 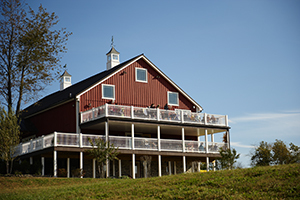 This winery won Gold Medal in the 2014 Virginia Governor’s Cup awards for their 201 Adagio. They won a Silver Medal for their 2010 Trianon and 2011 Acte 12 of 1619. They were awarded Bronze Medals for their 2011 Lord Botetourt and 2012 A Midsummer Night’s White. From the mountains to the sea, there are many wineries to visit, chat with the winemaker, and sample some of the varietals that grow here. For a list of wineries, wine festivals and wine events to enjoy not just during Virginia Wine Month but all year long, visit Virginia.org/Wine. Patrick Evans-Hylton, a Johnson & Wales University trained chef, is a Norfolk, Va.-based food journalist, historian and educator. 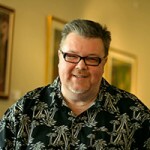 His work has appeared in print, television, radio and social media since 1995. Evans-Hylton calls his cookbook, Dishing Up Virginia, his love letter to the state’s foods and foodways. He blogs at PatrickEvansHylton.com. 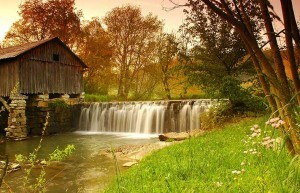 Watermills are one of those nostalgic scenes that make me skip a breath. 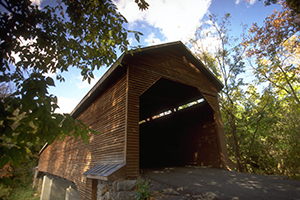 Covered bridges, swinging bridges, and old general stores have the same effect. It’s tangible history, but not of the stuffy, textbook variety. When you’re fortunate to find a watermill that’s still operational, it’s like being transported back into another time. A time of sweat equity and the satisfaction of just putting food on the table. See what I mean when you pay a visit to one of these old, glorious workhorses. Be sure to see the map below. 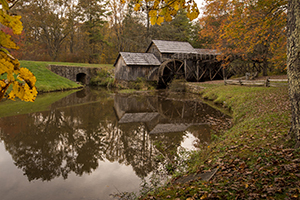 Virginia’s most recognized mill is Mabry Mill at milepost 176.1 on the Blue Ridge Parkway. It’s noted as the most photographed site on the Parkway, and for good reason. 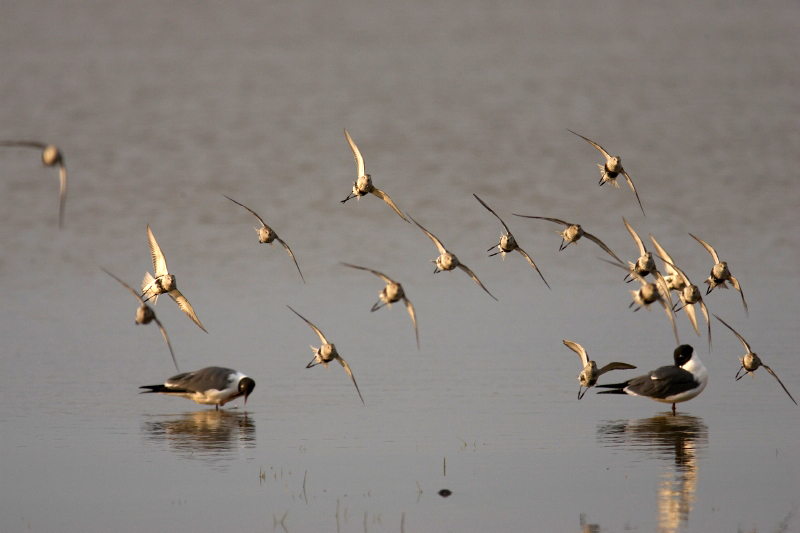 Abundant wildlife flock to the pond, showing off along with the scene itself. It doesn’t hurt that the buckwheat pancakes and other delightful dishes appeal to hungry travelers. You read right. There’s a restaurant and gift shop at this working mill, along with trades demonstrations, like blacksmithing, spinning and basketry. The Bush Mill in Nickelsville dates to 1896. The original mill was burned down on April Fools Day, which was no laughing matter for the people who relied on it. Once rebuilt, the mill operated into the 1950s. What you see when you visit to day is still an operational mill, as it has since been restored and sits proudly on the National Register of Historic Places. Share in the history by watching the video below. Cowan Mill, an 1890s mill, sits along Indian Creek on private property in Ewing. The mill is not open for tours, but is included here as a beautiful picture opportunity, as it is one of the most photographed sites in Lee County. Please be respectful of the property owners. One of Virginia’s more unique mills is Aldie Mill (1807-1809) in Loudoun County. It’s a real powerhouse with tandem wheels working to demonstrate the agricultural side of life. 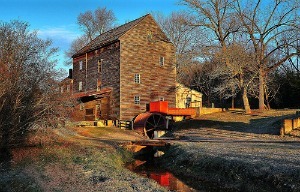 Aldie Mill bore witness to the Battle of Aldie (1863) during the American Civil War. In fact, it was the prelude to Gettysburg. Quite a few events are hosted at this mill each year; check the schedule. Also in Northern Virginia is Chapman’s Mill in Broad Run, believed to be the tallest stacked stone structure in the United States, as it stands five and one-half stories tall. The mill was constructed in 1742 and supplied food through five wars. Sadly, a 1998 arson fire gutted the interior of this prize. The ruins are stabilized and remain an interesting photo opp. The site is open to the public on Saturdays and Sundays. In Raphine you’ll find Kennedy-Wade’s Mill, a working 1750s mill that is still grinding away to bring you local flours and meals. What’s wonderful about Wade’s Mill are the culinary lessons offered by the miller’s wife! See what Georgie has cooking and make a date with deliciousness. Woodson’s Mill is a 1794 working gristmill in Nelson County. Locally-harvested grains are stone-ground daily with water from the Piney River. Be sure to take a few bags home, and maybe utilize the Hushpuppy & Batter Mix for fried Virginia oysters, as one of their blog posts suggests. It’s a wonder Virginia has as many watermills still in existence as there are, considering one of the Union goals during the Civil War was to cut off the Confederate food supply. Many mills were burned as a result. ~ Whittle’s Mill, South Hill – one of 35 mill sites along the Meherrin River, and a very good local swimming hole! ~ Parks Mill, Abingdon – restaurant on site! United States Route 11 runs north to south through the Shenandoah Valley, parallel to Interstate 81, from Clear Brook on the West Virginia line to Bristol on the Tennessee line. It’s a fantastic route that gets you out of traffic and into some of Virginia’s beautiful small towns. From the top to the bottom, here are just a few ideas for stops along this historic path between the mountains. The George Washington Hotel, a Wyndham Grand Hotel built in 1924, sits in the heart of Old Town Winchester just east of the pedestrian mall where shopping and dining are plentiful. 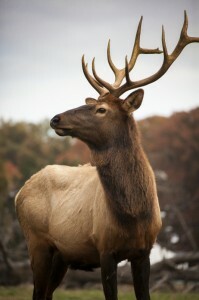 Watch for unexpected roadside delights like this! Name your favorite Route 11 stops by leaving a comment! Think spring and summer are the only beautiful seasons for gardens? Think again. It’s amazing to see some of the plants that thrive just after summer’s heat and prior to a late fall frost. Begin your journey of exploring Virginia’s fall gardens by checking out the brand new Richmond Garden Trail. It includes eight gardens within 10 miles of each other. Each site can easily stand on its own merit, but together, they’re a powerhouse of beauty. ~ Agecroft Hall Gardens – A 15th century Tudor built in Lancashire, England and moved to the banks of the James River in the 1920s. Look for the replica of William Shakespeare’s tombstone in the garden. It’s in honor of his 450th birthday in 2014. ~ Virginia Capitol Square – Did you know there’s an empty crypt on the grounds? It was to be George Washington’s final resting place, but you can find his real final resting place at his Mount Vernon Estate and Gardens (another stunning place to be in the fall, complete with extensive, restored gardens!). Tip: A wreath is laid at his tomb daily. ~ Edgar Allen Poe Museum – The Enchanted Garden was designed after Poe’s “To One in Paradise,” in 1921. If the grounds and walls of Virginia’s plantations could talk, oh, the stories they’d tell. 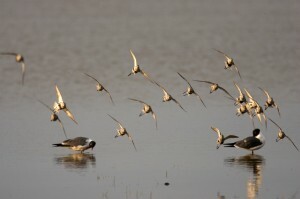 Some of them are known to us, excitingly. For example, Berkeley Plantation in Charles City was the site of the first Thanksgiving in 1619 and it’s also where “Taps” was written. 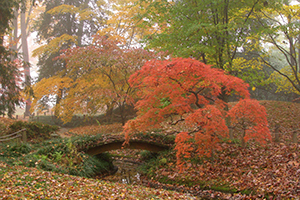 Visit to see the terraces of boxwood gardens. Among the oldest gardens in the country are those of Eyre Hall in Cheriton on the Eastern Shore. Circa 1800, you can expect to find sweeping crape myrtles shading paths, English gardens, and an 1819 orangery ruin. For more than 250 years this estate has remained in the same family; the eighth generation now keeps watch. 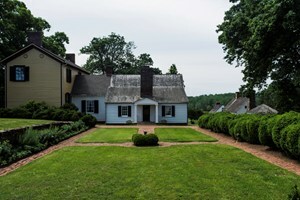 In Richmond, Thomas Jefferson’s boyhood home of Tuckahoe is considered to have one of the most complete 18th century plantation layouts in North America. Tuckahoe’s gardens are beautiful year ’round and you’re welcome to visit between 9 a.m. and 5 p.m. any day of the week. 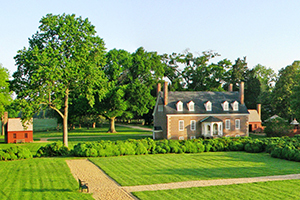 The gardens of Historic Kenmore Plantation in Fredericksburg were the very first to be revitalized by the Garden Club of Virginia. It was the recipient of further GCV attention in 1992 when a Wilderness Walk focusing on native plants was added. Patrick Henry’s Red Hill is located in Brookneal. He is said to have called his plantation, “one of the garden spots of the world,” so you must visit to see what all his fuss was about. Something for me to make a fuss about is the amazing Osage Orange Tree. It’s a National Champion tree and a member of the American Forestry Hall of Fame. 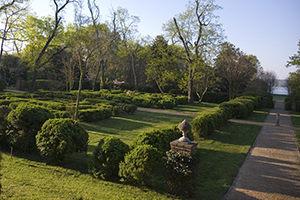 James Monroe’s modest Ash Lawn-Highland estate in Charlottesville includes a boxwood garden. 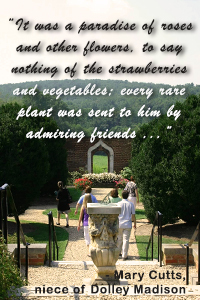 Thomas Jefferson’s Charlottesville home, Monticello, has extensive gardens – flower, vegetable, fruit, and more. The most recognizable are probably the 1000′ terrace garden and the borders of the west lawn. 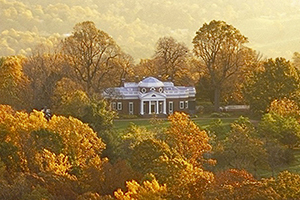 James Madison’s Montpelier in Montpelier Station is a 2,650-acre estate that boasts a 200-acre old-growth Landmark Forest and a two-acre formal garden known as the Annie duPont Formal Garden (William duPont purchased Montpelier in 1901). Woodrow Wilson’s Birthplace in Staunton includes Charles Gillette-designed landscaping (as do many of the other locations mentioned here). A visit to this garden, however, delivers Gillette’s only known bowknot boxwood design. It was installed after Wilson’s passing and was a project of the Garden Club of Virginia. 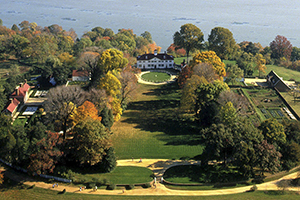 The aforementioned Mount Vernon Estate and Gardens of George Washington deserves repeating. 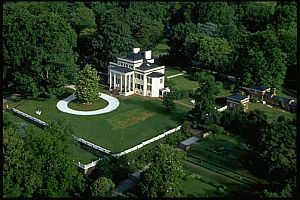 The grounds are lush and you’ll have to look for the original trees Washington himself planted. In Chase City you’ll find the MacCallum More Museum and Gardens, an eclectic space that includes interesting works of international art, sculptures and nine fountains. Norfolk Botanical Garden in Norfolk is 155 acres and is the only botanical garden in the nation that can be toured on foot, tram or boat! For fall, be sure to head to Mirror Lake. It’s one of the oldest sections of the garden and a great place for bird watching. Also note the five trees that are listed among the Remarkable Trees of Virginia: Coast Redwood, Crabapple, Crape Myrtle, Loblolly Pine, and White Oak (the oldest tree in the garden). 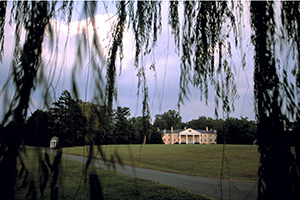 The State Arboretum of Virginia is located in Boyce and it’s part of the University of Virginia’s Blandy Experimental Farm. Of Note: North America’s largest variety of boxwood cultivars are found here, as are one-third of the world’s pine species. It’s an incredible, free place to visit. Another university-associated garden is the Edith J. Carrier Arboretum & Botanical Gardens at James Madison University in Harrisonburg. 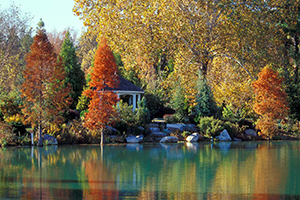 Seventeen different garden areas make this a beautiful place for fall explorations. 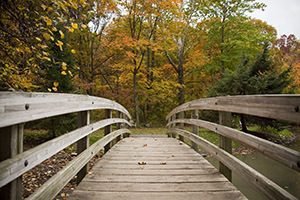 The Chesapeake Arboretum in Chesapeake is 48 acres of trails, mature hardwoods and native plants. A highlight here is the 1730s farmhouse. 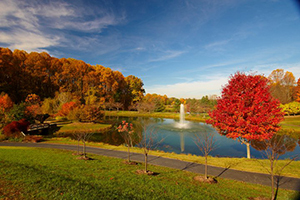 Vienna’s Meadowlark Botanical Gardens is a diverse 95 acres tucked away in Northern Virginia. Quite the delight! The garden is expanding with the Korean Bell Garden project and a Children’s Garden is planned. The Southern Virginia Botanical Gardens are found in South Boston. It’s a fairly new area, still growing, with hopes of a Visitor Center, Amphitheater and Splash Park in the future. In the works now is a Native American Medicine Wheel Herb Garden. Local Actor to appear in Olive Kitteridge on HBO. Local talent Devin Druid will appear in the upcoming miniseries on HBO Olive Kitteridge. Devin plays Christopher Kitteridge, son of Olive and Henry Kitteridge (played by Frances McDormand and Richard Jenkins, respectively). Parents traveling in the northern Shenandoah Valley and Virginia Piedmont may find great fun for their kids right at their fingertips with the new Shenandoah Valley Kids Trail. Designed with kid navigation in mind, the trail will let you and/or your darling get an idea of what’s cool in that neck of the woods. 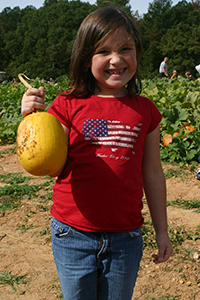 An example of what you will find within the mobile site are family festivals like Fall Festival at Massanutten Resort and Great Country Farms’ Pumpkin Harvest Festival, complete with photos, address, phone number and website for more information. 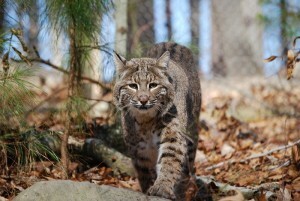 Some of the attractions are Bryce Resort Mountain Bike Trails, Dinosaur Land, and Shenandoah Caverns. There are orchards, farms, museums, outdoor recreation, and even fun history stops along the way. It always makes me feel good to know I’ve supported local businesses, especially the artisans. 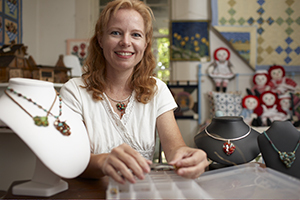 I often look for handmade jewelry, scarves and sketches to store away for gift-giving, and this week – American Craft Week, October 3-12, 2014 – celebrates those treasures I love. This season has many of us out and about anyway, soaking in the fall color, enjoying cooler temperatures, and tasting the local food, wine and craft beer. Why not also seek out the local galleries and shops to discover beautiful, and often affordable, homegrown artistry that awaits? 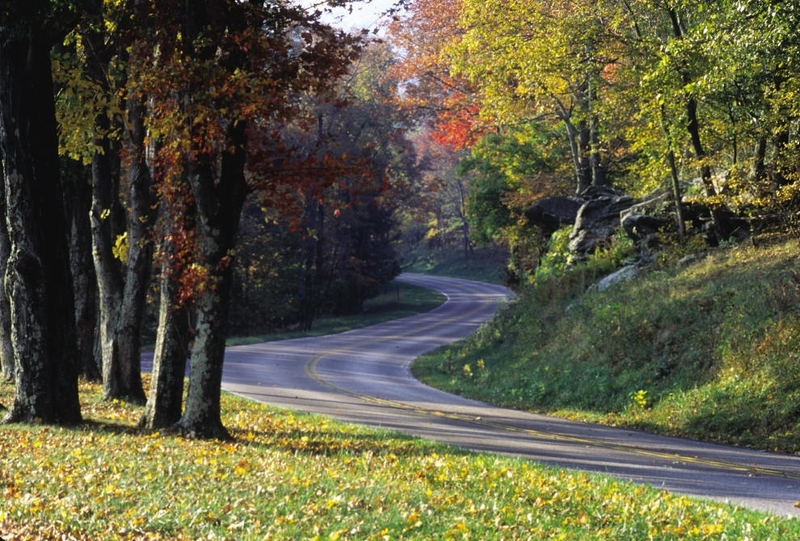 Make a scenic drive out of the Virginia Artisan Trails. There are more than 20 to choose from, and they’re all over the state. Wherever you want to go, there’s an artisan trail dotted with treasure troves nearby. 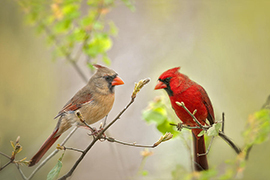 Go beyond bird seed and give birds access to plants that produce both fruits and insects. Not every species eats the same thing, so do your research. 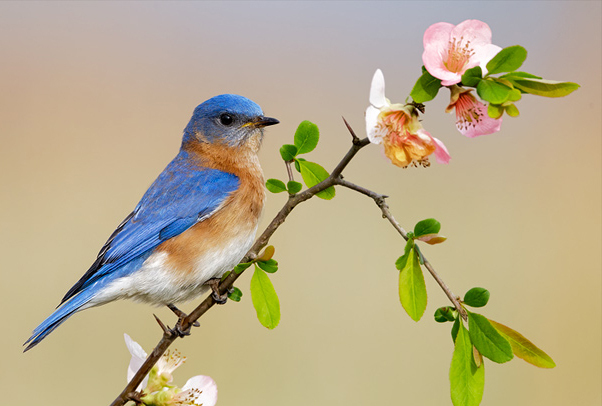 Many eat berries, nuts, nectar and the like, and migrate toward their preferred food. Do what ya gotta do to keep ‘em around! A happy yard is a happy bird. 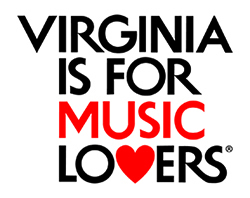 What do you think of when you consider Virginia’s music scene? You may not realize just how robust and varied the genres are that originated here, or which big names got their start in Virginia. Fife and Drums Corp at Colonial Williamsburg. CameronDavidson@CameronDavidson.com. In honor of September being declared Virginia Music Heritage Month, consider these music notes. 3. 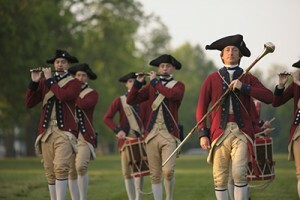 Speaking of Colonial Williamsburg, have you seen and heard the signature Fifes and Drums in person? 5. Speaking of Johnny Cash, did you know that his wife’s family (June Carter Cash) were the pioneers of country music? 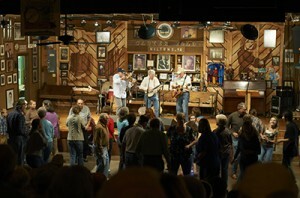 The Carter Family Fold, an acoustic-only venue honoring A.P. Sara and Maybelle, is located in Hiltons, Virginia, and you may visit for live concerts. Also check out the A. P. Carter Museum for artifacts and memorabilia. 6. Patsy Cline was born in Winchester and you can visit her home, as well as her grave, where you’ll find sweet mementos and pennies left for her. 7. 2014 was the year of Happy and “24 Hours of Happy,” the world’s first 24-hour music video by Pharrell Williams, the hip hop artist and producer from Virginia Beach. 8. Regarding Coastal Virginia talent, Williams’ Neptunes production team sidekick, Chad Hugo, hails from Virginia Beach, too, while hip hop queen Missy Elliott is from nearby Portsmouth and rapper/producer Timbaland is just a stone’s throw away in Norfolk. 9. Old time and bluegrass listeners readily know the name Ralph Stanley. He and his brother, Carter, are perhaps the best-known recorders of Man of Constant Sorrow, a track made popular by the film O Brother Where Art Thou, starring George Clooney. 10. If you ever “listen to the Mandolin Rain,” you’re listening to Williamsburg son Bruce Hornsby, a popular easy-listening/pop artist most renowned among baby boomers. 11. “The Most Awarded Act in the History of Country Music” is Staunton’s The Statler Brothers. They sang backup for Johnny Cash before breaking out with Flowers on the Wall. 13. Ella Fitzgerald, “The First Lady of Song,” was a jazz singer from Newport News who garnered 13 Grammy Awards over her career, as well as the Presidential Medal of Freedom Award in 1992. Request a Free Travel Guide or Download the eGuide. 1 “Was There Music in Jamestown in 1607?” The Colonial Music Institute. 2 Eighteenth-Century Music and Dance. Colonial Williamsburg Foundation. 3 “24 Notes that Tap Deep Emotions: The Story of Taps“. Villaneuva, Jari. BerkeleyPlantation.com. 4 “How Taps Became Associated with Funerals“. Villaneuva, Jari. TapsBugler.com. Labor Day has come and gone, and with the first of September comes the meteorological start of autumn. It may still be a few weeks before trees across Virginia light up in fiery reds, brilliant oranges and stunning yellows, but change is definitely in the air. Days are a little bit shorter, nights a little bit cooler, and shadows a little bit longer. 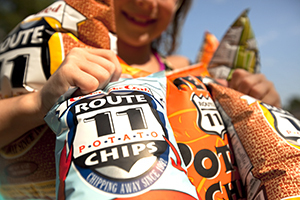 Add Skyline Drive to your route to The Apple House. Now is a great time to get out and explore Virginia, one bite at a time. Here are some ideas to guide you along your path. Autumn means heartier dishes; food to warm the body and soul. Across the state there are many wonderful offerings. Here are three that showcase a trio of Virginia’s culinary calling cards: apples, oysters and Brunswick Stew. At the northern entrance of Skyline Drive, in the middle of Virginia apple territory, The Apple House opened in 1963 selling ethereal rings of fried goodness. These treats, donuts made from apple butter and adorned with a sprinkling of cinnamon, are still offered today. A location in Front Royal also offers the donuts. Grab a dozen and enjoy the fall views along the byways here at the cusp of the Blue Ridge Mountains. We don’t need it to be an “R” month to enjoy one of Virginia’s gifts to the culinary world, but there is something about oysters in the fall, when they are plump and juicy. They are great on the half-shell, but equally awesome in a light batter and deep fried until golden brown and delicious. The generously-portioned oyster dinner comes with two sides and housemade sweet potato biscuits. Island House is designed after a 19th century life saving station; after dinner climb spiral staircase to lookout tower for stunning views of the surrounding marshes, tranquil and still in the autumn air. 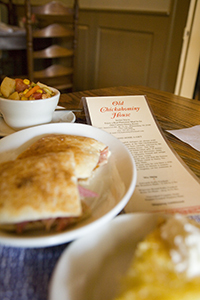 First opened in 1955 by Melinda Cowles Barbour, this restaurant and antique store/gift shop offers many Virginia-centric dishes, including Brunswick Stew. The stew, a richly flavored amalgamation of lima beans, corn and other vegetables with chicken and seasonings in a tomato broth base is sold with hot biscuits or crackers; or as part of Miss Melinda’s Special which also features a country ham biscuit, fruit salad, homemade pie and coffee or tea. It’s also offered to go by the pint or quart. While in town, walk through Colonial Williamsburg under soaring trees adorned in golden leaves to get a taste of 18th century Virginia. Sometimes its not just the destination, but also the journey. Of course journeys are made all the better knowing there is some delicious food waiting for you at the end. Here are some favorite places where getting there, and eating there, are rewarding anytime, including the fall. Located about halfway between Richmond and Williamsburg, Charles City Tavern is just off Route 5, also known as the John Tyler Memorial Hwy. This ribbon os asphalt follows the curves of the James River, and is a gorgeous drive any time of the year, including the fall, when the colors come alive. 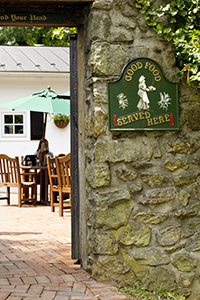 Stop before or after your meal at one of the famous James River Plantations along the way for a real treat. Berkeley Plantation, where the first bourbon in America was distilled and this country’s first Thanksgiving was celebrated is just four miles away. Located in a charming 1889 farmhouse on a 2,000-acre working farm, views of the surrounding countryside are afforded from the dining rooms and screened in porches. At dinner try the Eastern Shore Crab Cakes with Ragout of Sweet Corn and Virginia Ham. 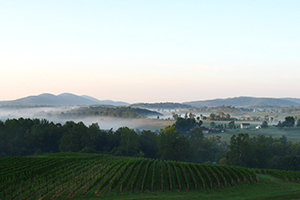 Immediately off the Blue Ridge Parkway, Chateau Morrisette is widely known for the quality vintages that the winery produces. But there is also a restaurant on-site serving up seasonal dishes and spectacular views. Opening up towards the west from the lodge-style dining room are gorgeous panoramas from the rolling hills and farmlands in the valley below to blue-hued mountains lit up in fall hues beyond. It’s not just the incredible views once you get to Chateau Morrisette, but the ones along the way down the Blue Ridge Parkway. Take extra time to stop and snap photos. Enjoy the Pork Tenderloin, which is infused with locally grown oregano, grilled and drizzled with roasted pepper and tomato coulis, and served with rice, fried green tomatoes and house collards. Pair it with a Cabernet Franc from the winery next door. Route 50, also called John S. Mosby Highway, cuts an east-west path through scenic horse country in Virginia and offers many spectacular vistas, especially heading away from the Washington D.C. area where the beautiful Blue Ridge Mountains loom on the horizon. 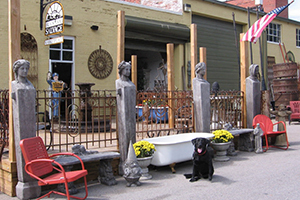 Both Upperville, where the tavern is located, and nearby Middleburg are scenic towns, providing a good opportunity to stop and take a walk exploring antique shops and galleries. Hunter’s Head Tavern is located in the historic 1750 Carr House, which began as a log cabin when this part of Virginia was on the western frontier of the nation. There are charming colonial features throughout. Enjoy the Stuffed Rainbow Trout with House-Cured Bacon and Local Mushrooms; the trout is sustainably harvested seafood. The bacon and mushrooms are locally sourced; organic meats and produce come from neighboring Ayrshire Farm, which raises only Certified Humane animals. Nestled in the mountains, just off the Blue Ridge Parkway, Peaks of Otter Lodge, celebrating its 50th anniversary, is a perfect place to enjoy nature, especially when the surrounding landscape comes afire with fall color. 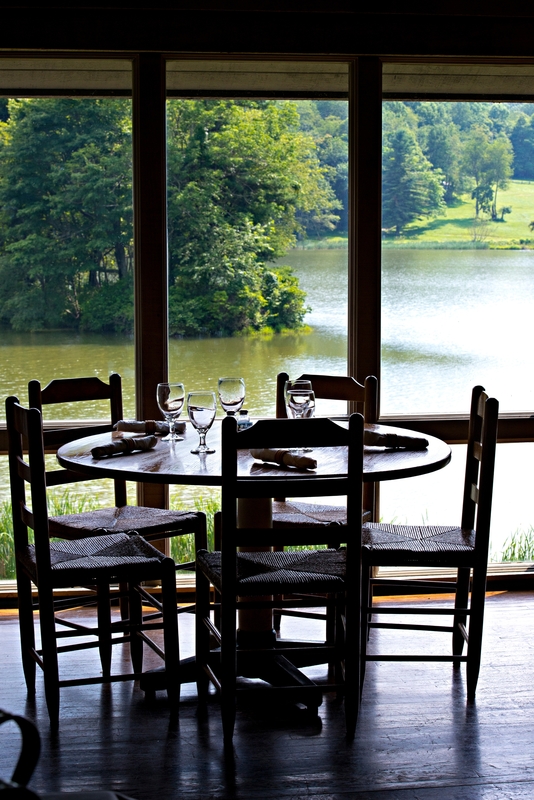 The trip to the lodge is filled with scenic opportunities, as is the view from the lodge dining room. The space here opens up onto an expansive vista onto Abbot Lake and the rolling Blue Ridge in the background. Blue Ridge Half Chicken, fried or roasted, and served with caramelized apples, cranberry relish, garlic mashed potatoes and housemade gravy. The fried chicken is done low and slow; it’s cooked to order and you’ll have to wait about 20 minutes but it’s essential in a perfect crispness. On Friday nights there is a seafood buffet that includes crab legs, shrimp, clams, fish, oysters and even frog legs. This dish was created in 1828 in Brunswick County, according to legend, and is open to interpretation and inspiration as ingredients go. 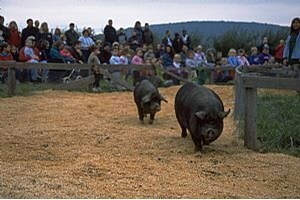 Rabbit and squirrel were once the primary components, while today chicken and pork are used. Most Brunswick stews are tomato based and augment an animal protein with lima beans, corn, potatoes, and often okra. Make the chicken. Place the chicken in a large stockpot and cover with water. Add the onion, carrots, celery, garlic, parsley, bay leaf, peppercorns, and sea salt. Cover the pot and bring the liquid to a boil, then reduce the heat to a slow boil and cook until the chicken is tender and the meat is falling off the bone, 45 to 90 minutes. 15 minutes. Transfer the chicken to a plate or cutting board to cool; do not discard the broth. Debone the chicken and shred or chop the meat. Strain the broth; cool, and skim off the fat. 4 full cups, use additional chicken or vegetable stock, or water to make up the difference.) Add the potatoes and onion, and bring to a boil. Continue boiling until the potatoes begin to soften, about 10 minutes. Stir in the tomato paste. Add the reserved chicken. Reduce to a simmer and add the tomatoes, lima beans, corn, sugar, salt, black pepper, and red pepper. Stir well and simmer, uncovered, for about 1 hour, stirring occasionally. Add additional broth or water if needed, but stew should be thick. Remove the stew from the heat. Stir in the butter until it melts and serve immediately. The phone number for the Crossroads office is 804-278-8950. 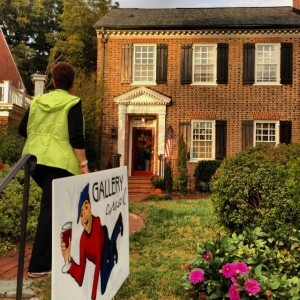 The Crossroads Art Center is located at 2016 Staples Mill Road, Richmond, Virginia 23230. Ready for a ride on the Virginia craft beer bandwagon? If so, please do one of two things: 1) Designate a driver or 2) Take a chauffeured tour. Here’s how you can responsibly sip, sample and enjoy Virginia craft beer. Virginia’s Blue Ridge Beer Loop was unveiled just in time for August Virginia Craft Beer Month and includes six breweries around the Roanoke Valley. The Loop is a self-guided tour, which enables you to take your time and truly enjoy that one beer you find and love. Big Lick Brewing Co. – Roanoke – opening Labor Day weekend! In a similar way, the Brew Ridge Trail incorporates many of the sites mentioned above, plus hops over to Charlottesville to pick up Starr Hill and South Street breweries. Additional attractions and places to stay are also listed for consideration. Holladay House Bed and Breakfast in Orange is offering private tours for two to six in a luxury Cadillac Escalade. Tour sites can include breweries, wineries or cideries. 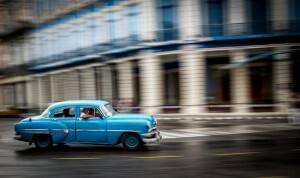 This is an add-on to your stay with rates from $225 for six. 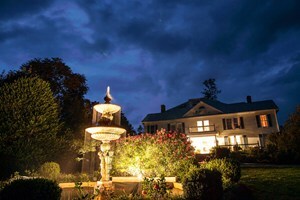 Belle Hearth Bed and Breakfast in Waynesboro invites you to stay two nights and receive a welcome basket of wine or beer and other goodies. 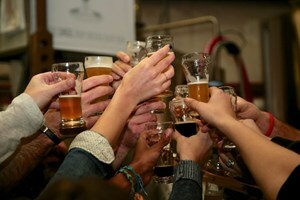 Your stay will include a chauffeured tour to three wineries and/or microbreweries. Rates from $380 (room included). Offer good through November 30, 2014. Where will your love of craft beer take you? Check out Virginia.org/CraftBeer to see what you’re missing. After months of teasing photographs on An Bui’s series of Facebook pages, the date is now set!